Secretary of State Mike Pompeo held a press conference at the State Department Friday afternoon to officially condemn former Secretary of State John Kerry for working to undermine U.S. national security.
.@SecPompeo: "What Secretary Kerry has done is unseemly and unprecedented." He also says: "Secretary Kerry ought not to engage in that kind of behavior." 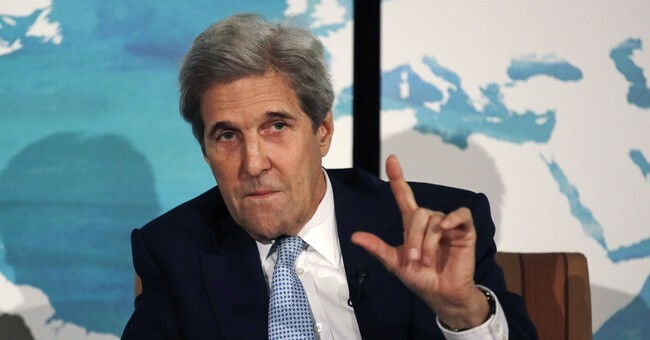 Former Secretary of State John Kerry made a few admissions in his interview with radio host Hugh Hewitt Wednesday. One revelation generating a lot of buzz is that, unbeknownst to President Trump, he has met with Iranian officials in recent months to try and save the Iranian nuclear deal, signed by President Obama in 2015. Kerry has met with Iranian Former Minister Javad Zarif three or four times, while Trump took America out of the nuclear deal in May. "I think I've seen him three or four times," Kerry told Hewitt.